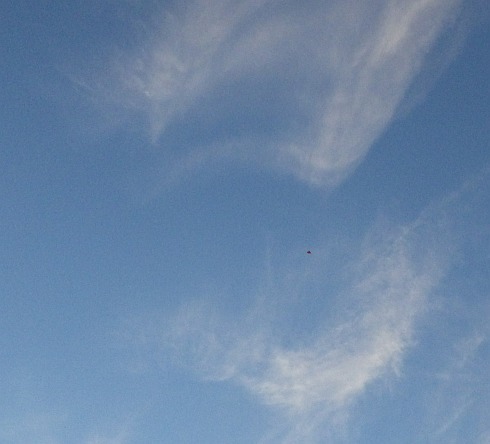 Several days ago, the redesigned 2 Skewer Delta kite, which I am calling the Mk2, first ventured into the air. That was in our small back yard. Just 30 seconds in the air was enough to demonstrate a few good flying characteristics. Of course, that left a strong desire to see what the kite could do on a long, light Dacron line over a large field! Today was the day. While en-route to the large school reserve the weather appeared ominously calm. Would there even be enough movement up there to fly at all? Thankfully, on stepping out of the car, the tiniest of puffs made their presence felt against my face. That would do! Bamboo and plastic is awesome in very light wind. Even so, the first few flights were merely pull-ups into fairly dead air. It was interesting to watch the kite descending slowly in tight circles during one such flight. Normally, a kite will drift off downwind when given some slack line - but in zero wind a Delta becomes a glider. As is my style, I just kept on trying. Pulling out a little more line each time. It wasn't hard to dance the kite just off the grass while jogging backwards and letting line slip. A few quick pull-ins would then send the kite scooting straight upwards. In this way, the first signs of a flight-sustaining breeze were discovered, up around 50 feet. So far, the bright orange Delta with black triangular keel was not disappointing. In both the looks and performance departments! With almost 30 meters (100 feet) of line out, the kite tucked its wing tips in a little and rocketed up in response to a firm pull-in. Finally, there was enough air movement up there to allow a slow and steady line-of-sight climb-out. But not before a few photos and a couple of short videos were taken. Then the climb was continued more or less constantly until all but a couple of turns were left on the winder. That left the 120 meter (400 feet) tag dangling just in front of the tree trunk which was being used as an anchor. I had left my kite bag some distance way. While retrieving it, the breeze suddenly died off. The only evidence of this was the line angle of the kite, which had started to decline. The small Delta remained almost motionless apart from the very slow but steady descent. Quickening my pace, I arrived back at the tree just as the breeze put a few kph back on. Again, the only evidence of this was the line flattening out and the kite commencing a steady climb. Nice to watch! The kite had bottomed out at a mere 20 degrees or so of elevation from the grass. Back at full height again, the line near the tree raised and lowered by a few centimeters as subtle changes in wind speed affected the kite. The kite itself was too far away to see any movement at all. Soon it was time to start winding in. I continued to do this while walking across to where the car was parked. Pausing to check the time, I placed the chunky wooden winder on the grass - where it stayed, successfully holding against the gentle tension in the line. Below 50 feet, the 2 Skewer Delta kite flew around more chaotically before finally sinking to the grass. By now, the sun was just minutes from the horizon, with pink hues developing in the sky all around. I held the wind meter up for almost half a minute, but the cups barely moved at all. Zero gusting to zero it read, even at above shoulder height! A very satisfying first high flight for the new Delta design. Despite a tiny lean to the right which can be seen in the video below. Easily fixed with a short bit of tape protruding from one wing-tip. 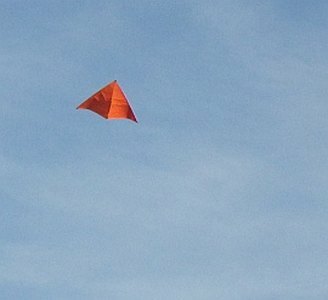 With the right materials and the right line, even quite small kites can brush against the legal altitude limit!